Authors: Kulikov A.N., Sosnovskii S.V., Nikolaenko E.N. Background. The article presents impact results of vitrectomy for complicated cataract surgery on retinal and optic nerve electrogenesis. Materials and methods. 30 patients (30 eyes) with history of dropped nucleus (1st group) or intraocular lens dislocated into the vitreous cavity after phacoemulsification (2nd group) underwent electrophysiological examination before vitrectomy, and on Day 1, Day 3, Day 7, Day 14, Day 30, Day 60, and Day 180 after surgery. Results. In the 1st and 2nd groups, on the 1st day after vitrectomy, we observed a significant decrease in retinal and optic nerve electrogenesis in comparison to normal indices (p > 0.01); to Day 180, electrophysiologic indices returned to normal values. In the 1st group, baseline retinal and optic nerve electrogenesis was decreased in comparison to normal parameters. In the 1st and 2nd groups, the electrogenesis of photoreceptors recovered twice as rapidly, as that of bipolar cells; papillomacular bundle neurons were more resistant to vitrectomy. Conclusion. Thus, the presence of lens nucleus fragments in the vitreous cavity results in a reliable inhibition of the retinal and optic nerve electrogenesis due to phacotoxic effect. Vitrectomy causes a short-term depression of the retinal and optic nerve electrogenesis, followed by normalization of indices to Day 180. Photoreceptors have greater rehabilitation activity than bipolar cells. The neurons of axial topographic orientation have the highest resistance to vitrectomy impact. vitrectomy, IOL dislocation, dropped nucleus dislocation, flash visually evoked potentials, complicated cataract surgery, electroretinogram, electrophosphene. In developed countries, improvements in healthcare are one of the important factors contributing to increasing life expectancy . Due to population aging, the number of people with cataract is constantly increasing. According to the World Health Organization, cataract accounts for over 47% of all eye disorders worldwide . In fact, approximately 10 million cataract surgeries are performed annually, and the number of these procedures has been constantly increasing by 2–2.5 million annually . Cataract phacoemulsification (PE) with implantation of an intraocular lens (IOL) is a widely accepted option that can ensure complete functional rehabilitation of a patient [4, 5]. However, cataract surgery carries the risks of intraoperative and long-term complications . In 0.05%–1.2% of cases, cataract surgery causes dislocation of the lens nucleus, its fragments, and lens masses into the vitreous chamber (VC) [7, 8]. This intraoperative complication substantially affects further patient management. Approximately 0.2%–2.8% of patients who undergo cataract surgery subsequently develop late luxation and dislocation of the IOL on the ocular fundus , a complication that markedly reduces the quality of life and functional outcomes of the surgery. In such cases, vitreoretinal surgery should be considered to address complications and restore the normal anatomical structure of the eyeball [10, 11]. However, functional results of vitreoretinal rehabilitation are often regarded unsatisfactory by surgeons and patients . Unlike uncomplicated cataract surgery, vitrectomy (VE) involves many potentially damaging physical and chemical factors, including high-frequency vibration of the vitreotome tip, various irrigation solutions, artificial vitreous body, and light from an endoilluminator. These negative effects on the retina and optic nerve probably contribute to the unsatisfactory functional outcomes of VE. The aim of this study was to perform a comprehensive comparative analysis of the bioelectric activity of the retina and optic nerve before and after VE for complicated cataract surgery. The inclusion criteria were as follows: dislocation of the lens nucleus, its fragments, or IOL into the VC; VE to repair dislocation of the lens nucleus, its fragments, or IOL into the VC; and patient compliance with electrophysiological monitoring during the study. The exclusion criteria were as follows: history of ophthalmic disorders that could potentially affect retinal and optic nerve electrogenesis (including diabetic retinopathy, retinal detachment, and post-thrombotic retinopathy) and intraoperative complications that could potentially affect retinal and optic nerve electrogenesis (including iatrogenic retinal detachment, extensive submacular hemorrhage, and circulatory disorders in the retina and optic nerve). This study included patients who underwent VE at the Ophthalmology Clinic of S.M. Kirov Military Medical Academy between 2012 and 2017. A total of 1,268 patients were examined; among these, 30 patients (30 eyes) met the inclusion criteria. The sample included 18 men and 12 women with a mean age of 73.26 ± 10.48 years. All participants underwent 25G transciliary subtotal VE using the Accurus vitrectomy system (Alcon, USA). The average operating frequency of the vitreotome was 2,500 Hz. The volume of tissue removed was replenished with balanced salt solution. The dislocated fragments of the lens nucleus were removed with the vitreotome or ultrasound. The dislocated IOL was lifted up toward the pupil plane and sutured to the iris. All patients underwent VE and many electrophysiological tests (EPTs). Visual acuity was measured using Sivtsev charts, and the bioelectric activity of the retina was evaluated using objective EPTs, namely, full-field electroretinography (ffERG) and flicker electroretinography (fERG) at a frequency of 30 Hz. The functional state of the optic nerve was evaluated by registration of flash visual evoked potentials (fVEPs) (objective EPT) and assessment of the electrical sensitivity (ES) threshold and critical flicker-fusion frequency (CFF) (subjective EPT). All objective EPTs were conducted according to the standards of the International Society for Clinical Electrophysiology of Vision [13, 14]. We used the EP 1000 Multifocal system (Tomеy Corporation, Japan) to evaluate ffERG, fERG 30 Hz, and fVEPs. CFF was assessed using the electroophthalmic stimulator “Esofi01” (Spetsmedpribor, Russia). We analyzed the following ffERG parameters: A-wave and B-wave amplitudes (µV), absolute changes in the A-wave and B-wave amplitudes (µV), relative changes in the A-wave and B-wave amplitudes (%), A-wave and B-wave latencies (µV), absolute changes in the A-wave and B-wave latencies (µV), and relative changes in the A-wave and B-wave latencies (%). For fERG result analysis, we evaluated the fERG amplitude (µV), absolute changes in the fERG amplitude (µV), and relative changes in the fERG amplitude (%). Moreover, in the analysis of fVEPs, we assessed the N2 and P2 latencies (ms), absolute changes in the N2 and P2 latencies (ms), relative changes in the N2 and P2 latencies (%), N2 and P2 amplitudes (µV), absolute changes in the N2 and P2 amplitudes (µV), and relative changes in the N2 and P2 amplitudes (%). We also estimated the ES threshold (µA), CFF (Hz), and relative changes in the ES and CFF (%). Visual acuity testing and EPTs were conducted before VE and on days 1, 3, 7, 14, 30, 60, and 180 after surgery. Data analysis was performed using Statistica v. 10.0 software. We used the methods of descriptive statistics, correlation analysis, and Wilcoxon test. Group 1 included 20 patients (20 eyes) who had dislocation of the lens nucleus, its fragments, and lens masses into the VC, whereas Group 2 included 10 patients (10 eyes) with luxation and displacement of the IOL into the VC. The control group comprised 35 patients who underwent standard PE with flexible IOL implantation without complications. Changes in visual acuity in Groups 1 and 2 are shown in Figure 1. Patients from Group 1 had the following baseline parameters reflecting retinal electrogenesis: A-wave amplitude of 98.44 ± 14.89 µV in ffERG, B-wave amplitude of 188.11 ± 27.07 µV in ffERG, and fERG amplitude of 19.58 ± 1.84 µV. The functional acti vity characteristics of the optic nerve were as follows: N2 latency of 85.24 ± 4.73 ms in fVEPs, P2 latency of 131.75 ± 4.82 ms in fVEPs, ES threshold of 101.5 ± 14.31 µA, and CFF of 35.25 ± 2.35 Hz. The dislocated fragments of the lens nucleus and its fragments remained in the VC for 6.1 ± 2.1 days. Group 1. When analyzing the dynamics of retinal electrogenesis at the photoreceptor level, we observed a significant reduction in the A-wave amplitude measured using ffERG 1 day postoperatively (p < 0.05). Starting from day 3 postoperatively, we observed a trend toward the restoration of photoreceptor electrogenesis (increased A-wave amplitude in ffERG). By day 30, the A-wave amplitude was completely normalized. Analysis of the dynamics of retinal electrogenesis at the level of bipolar cells revealed a significant reduction in the B-wave amplitude measured with ffERG 1 day postoperatively (p < 0.05) (Figu res 5–7). Starting from day 3 postoperatively, we observed a trend toward the restoration of electrogenesis in bipolar cells (increased B-wave amplitude in ffERG). Remarkably, by day 60, the B-wave amplitude was within the normal limits. Analysis of the changes in electrogenesis of the retinal cone system demonstrated a significant reduction in fERG amplitudes 1 day postoperatively (p < 0.05) (Figures 8–10). Starting from day 3 after VE, there was a trend toward the restoration of electrogenesis in the retinal cone system, i. e., increased fERG amplitude. By day 30, the fERG amplitude was completely restored. Analysis of the dynamics of the functional state of the optic nerve demonstrated a significant increase of P2 latency in fVEPs 1 day postoperatively (p < 0.05) (Figures 11–13). Starting from day 3 postoperatively, there was a trend toward the restoration of the speed of bioelectrical signals, i. e., decreased P2 peak latency in fVEPs. By day 30, the P2 latency was completely normalized. In addition, we observed a significant increase of N2 latency in fVEPs 1 day postoperatively (p < 0.05) (Figures 14–16). Starting from day 3 after VE, we detected a trend toward the restoration of the speed of bioelectrical signals, i. e., decreased N2 peak latency in fVEPs. By day 30, the P2 latency was completely restored. Analysis of changes in parameters that reflect the functional state of the internal retinal layers demonstrated a significant increase in the ES threshold 1 day postoperatively (Figu res 17–19). Starting from day 3 postoperatively, we observed gradual restoration of the ES thres hold. By day 60, it steadily decreased to baseline levels. Analysis of changes in the condition of the papillomacular bundle of the optic nerve showed a significant decrease in CFF 1 day postoperatively (Figu res 20–22). Starting from day 14 after VE, we observed restoration of CFF, which continued until the end of follow-up. In Group 2, the baseline characteristics of retinal electrogenesis were as follows: A-wave amplitude, 132.8 ± 16.1 µV in ffERG; B-wave amplitude, 263.31 ± 26.1 µV in ffERG; and fERG amplitude, 22.7 ± 1.8 µV. The characteristics of functional activity for the optic nerve were as follows: N2 latency, 81.1 ± 6.9 ms; P2 latency, 121.12 ± 4.73 ms; ES threshold, 81.12 ± 11.54 µA; and CFF, 38.5 ± 2.54 Hz. The dislocated IOL remained in the VC for 404.4 ± 40.5 days. Group 2. When analyzing the dynamics of retinal electrogenesis at the photoreceptor level, we observed a significant reduction in the A-wave amplitude measured with ffERG 1 day after VE (p < 0.05). Star ting from day 3 postoperatively, we detected a trend toward the restoration of photoreceptor electrogenesis (increased A-wave amplitude in ffERG). By day 14, the A-wave amplitude returned to baseline levels. While analyzing the dynamics of retinal electrogenesis at the level of bipolar cells, we also found a significant reduction in the B-wave amplitude measured with ffERG 1 day postoperatively (p < 0.05) (Figures 5–7). Starting from day 3 after VE, we observed a trend toward the restoration of electrogenesis in bipolar cells (increased B-wave amplitude in ffERG). By day 30, the B-wave amplitude was within the normal limits. Analysis of the dynamics of electrogenesis in the retinal cone system demonstrated a significant reduction in the fERG amplitude 1 day postoperatively (p < 0.05) (Figures 8–10). Starting from day 3 after VE, we registered gradual restoration of electrogenesis in the retinal cone system (increased fERG amplitude). By day 14, the fERG amplitude was completely restored. When analyzing the dynamics of the functional state of the optic nerve, we observed a significant increase of P2 latency in fVEPs 1 day postoperatively (p < 0.05) (Figures 11–13). Starting from day 3 postoperatively, there was a trend toward the restoration of the speed of bioelectrical signals, i. e., decreased P2 peak latency in fVEPs. By day 14, the P2 latency returned to baseline levels. We also observed a significant increase of N2 latency in fVEPs 1 day postoperatively (p < 0.05) (Figures 14–16). Starting from day 3 after VE, we detected a trend toward the restoration of the speed of bioelectrical signals (decreased N2 peak latency in fVEPs). By day 14, the P2 latency was completely restored. Analysis of changes in parameters that reflect the functional state of the internal retinal layers demonstrated a significant increase in the ES thres hold 1 day postoperatively (Figures 17–19). Starting from day 3 postoperatively, we observed gradual restoration of the ES threshold. By day 14, it steadily decreased back to baseline levels. Analysis of changes in the condition of the pa pillomacular bundle of the optic nerve showed a significant decrease in CFF 1 day postoperatively (Figures 20–22). Starting from day 7 after VE, we observed the restoration of CFF, which continued until the end of follow-up. Control group. In the control group, all assessed parameters (including A-wave and B-wave amplitudes measured with ffERG, fERG 30 Hz amplitude, N2 and P2 latencies, ES, and CFF) were characterized by minor fluctuations during the entire follow-up period with no significant differences among the different time points. The baseline latencies in ffERG differed between the study groups. In Group 1, the A-wave latency was 25.66 ± 1.41 ms, whereas the B-wave latency was 45.96 ± 2.19 ms. In Group 2, the A-wave and B-wave latencies were 25.43 ± 0.65 ms and 45.81 ± 1.88 ms, respectively. Further, in the control group, the A-wave latency was 25.48 ± 0.82 ms, whereas the B-wave latency was 45.25 ± 1.22 ms. The time-based characteristics of the A-waves and B-waves were stable with no significant differences among different time points. The baseline amplitudes of the fVEP components also differed among the groups. In Group 1, the N2 amplitude was 7.63 ± 1.31 µV and P2 amplitude was 15.22 ± 2.56 µV. In Group 2, the N2 and P2 amplitudes were 7.41 ± 1.31 µV and 45.96 ± 2.19 µV, respectively. In the control group, the N2 and P2 amplitudes were 25.66 ± 1.41 µV and 45.96 ± 2.19 µV, respectively. N2 and P2 amplitudes in fVEP were stable with no significant differences among the different time points. Comparative analysis of the baseline amplitudes in ffERG measured in the three groups demonstrated following results: significant difference in terms of the A-wave amplitude between Group 1 and the control group (p < 0.05); no difference in terms of the A-wave amplitude between Group 2 and the control group (p > 0.05); significant difference in terms of the B-wave amplitude between Group 1 and the control group (p < 0.05); and no difference in terms of the B-wave amplitude between Group 2 and the control group (p > 0.05). Comparative analysis of the baseline amplitudes in 30 Hz fERG measured in the three groups demonstrated following results: significant difference in terms of the fERG amplitude between Group 1 and the control group (p < 0.05) and no difference in terms of the fERG amplitude between Group 2 and the control group (p > 0.05). Further, comparative analysis of baseline latencies and amplitudes in fVEP measured in the three groups demonstrated the following results: significant difference in terms of N2 and P2 latencies in fVEP between Group 1 and the control group (p < 0.05); no difference in terms of N2 and P2 latencies in fVEP between Group 2 and the control group (p > 0.05); significant difference in terms of both N2 and P2 amplitudes in fVEP between Group 1 and the control group (p < 0.05); and no difference in terms of N2 and P2 amplitudes in fVEP between Group 2 and the control group (p > 0.05). Comparative analysis of baseline ES thresholds in the three groups demonstrated following results: significant difference in terms of ES between Group 1 and the control group (p < 0.05) and no difference in terms of ES between Group 2 and the control group (p > 0.05). Comparative analysis of baseline CFF values in the three groups demonstrated the following results: significant difference in terms of CFF between Group 1 and the control group (p < 0.05) and no difference in terms of CFF between Group 2 and the control group (p > 0.05). Notably, we observed no correlation between visual acuity and the electrophysiological parameters measured at all time points. Retinal electrogenesis is a fundamental function of retinal neurons characterized by the formation and spread of a bioelectric signal across the membrane of the nerve cell in response to adequate light stimulus . Nervous tissue is highly sensitive to various damaging factors that can potentially affect their main functions and lead to parabiosis . The currently available literature suggests that native lens should be removed if the capsule is damaged and when the patient has inflammation, increased intraocular pressure, or synechiae in the vitreous body because it may lead to permanent visual impairments . Late IOL dislocations that remain in the VC for up to 5 years are associated with multiple complications, including retinal detachment, and cystoid macular edema. An active surgical tactic is needed to prevent such complications . In such cases, the IOL can be sutured to the iris or explanted . The two main groups in our study comprised patients who had a foreign body in the VC (lens masses and fragments of the lens nucleus in Group 1 and IOL in Group 2). Analysis of the baseline electrophysiological parameters facilitated the determination of the effect of various foreign bodies on retinal and optic nerve electrogenesis. We observed significant differences in terms of the amplitudes of electrogenesis between patients with dislocation of lens nuclear fragments into the VC and controls. However, there were no significant differences in terms of baseline electrogenesis parameters between patients with IOL dislocation to the VC and controls. Therefore, the nature of a foreign body located in the VC is probably crucial because it inhibits retinal and optic nerve electrogenesis primarily by producing a phacotoxic effect (not mechanical damage) resulting from the interaction between lens masses and the retina. VE had a negative effect on the functional state of the retina and optic nerve, manifesting as significant inhibition of electrogenesis in various neurons 1 day postoperatively in each group. Subsequent restoration of electrogenesis in the retina and optic nerve occurred at different rates in different groups of patients. Electrogenesis recovered twice faster in participants with IOL dislocation into the VC compared with those with dislocation of the lens nucleus or its fragments. Slower restoration of retinal electrogenesis can be associated with the phacotoxic effects of the lens (or its fragments) on the retina in the patients from Group 1, whereas the patients from Group 2 had no phacotoxic effects. A detailed analysis of electrogenesis at the photoreceptor level revealed restoration of the bioelectric activity in neurons on day 30 postoperatively in Group 1 and day 14 postoperatively in Group 2. Electrogenesis recovery at the level of bipolar cells was observed on postoperative days 60 and 30 in Groups 1 and 2, respectively. In both groups, photoreceptors restored electrogenesis twice as fast as bipolar cells did. The recovery of electrogenesis in the retinal cone system was detected on day 30 after VE in Group 1 and on day 14 in Group 2. Therefore, type I neurons tend to have greater regenerative capacity than type II neurons. A detailed analysis of electrogenesis at the level of the retinal ganglion cells demonstrated restoration of the speed of bioelectrical signals on postoperative day 30 in Group 1 and postoperative day 14 in Group 2. The analysis of CFFs showed that axially aligned neurons, which ensure functional activity of the papillomacular bundle, are less sensitive to VE than extra-axially aligned neurons, which are responsible for functional activity of the ganglion cells of the entire retina. Dislocation of the lens nucleus or its fragments into the VC significantly inhibits retinal electrogenesis due to the phacotoxic effect on photoreceptors, bipolar cells, and ganglion cells. VE causes short-term inhibition of retinal bioelectric activity at the level of photoreceptors, bipolar cells, and ganglion cells with subsequent restoration by the end of follow-up. Photoreceptors have greater regenerative capa city than retinal bipolar neurons, and axially aligned neurons exert the highest resistance to VE. A.N. Kulikov and S.V. Sosnovskiy developed the research concept. E.N. Nikolaenko performed data analysis and drafted the manuscript. World Health Organization Study Group On. The prevention of blindness - report of a WHO Study Group. Technical report series. № 518. Geneva; 2012. W.H.O. - Режим доступа: www. whqlibdoc.who.int/trs/WHOTRS 518. pdf. Zhu M, Zhu J, Lu L, et al. Four-year analysis of cataract surgery rates in Shanghai, China: a retrospective cross-sectional study. BMC Ophthalmol. 2014;10(14):3-8. doi: 10.1186/1471-2415-14-3. Abulafia A, Rosen E, Assia EI, Kleinmann G. Establishment of a Registry to Monitor Trends in Cataract Surgical Procedures and Outcomes in Israel, 1990-2014. Isr Med Assoc J. 2015;17(12):755-759. Ascaso FJ, Huerva V. Grzybowski A. Epidemiology, etiology, and prevention of late IOL-capsular bag complex dislocation: review of the literature. J Ophthalmol. 2015;2015:805-807. doi: 10.1155/2015/805706. McCulloch DL, Marmor MF, Brigell MG, et al. ISCEV Standard for full-field clinical electroretinography (2015 update). Doc Ophthalmol. 2015;130(1):1-12. doi: 10.1007/s10633-014-9473-7. Odom JV, Bach M, Brigell M, et al. ISCEV Standard for clinical visual evoked potentials: (2016 update). Doc Ophthalmol. 2016;133(1):1-9. doi: 10.1007/s10633-016-9553-y. Millar ER, Steel DH. 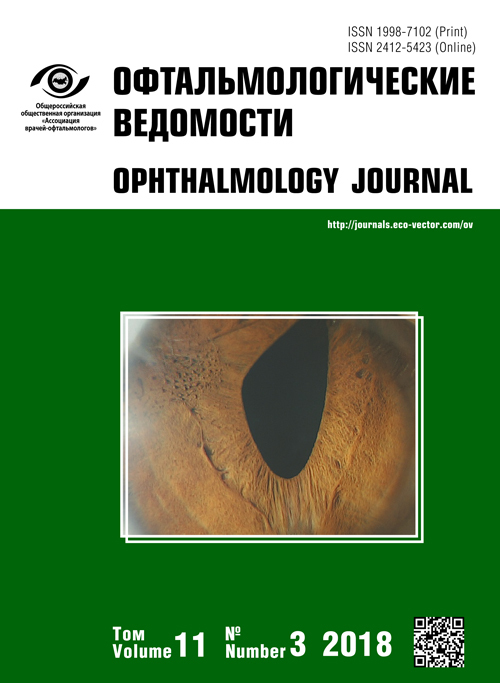 Small-gauge transconjunctival vitrectomy with phacoemulsification in the pupillary plane of dense retained lens matter on perfluorocarbon liquids after complicated cataract surgery. Graefes Arch Clin Exp Ophthalmol. 2013;251(7):1757-1762. doi: 10.1007/s00417-013-2293-8. Scupola A1, Abed E, Sammarco MG, et al. 25-Gauge pars plana vitrectomy for retained lens fragments in complicated cataract surgery. Ophthalmologica. 2015;234(2):101-108. doi: 10.1159/000434732. Rey A, Jürgens I, Dyrda A, et al. Surgical outcome of late in-the-bag intraocular lens dislocation treated with pars plana vitrectomy. Retina. 2016;36(3):576-581. doi: 10.1097/IAE.0000000000000738. Copyright (c) 2018 Kulikov A.N., Sosnovskii S.V., Nikolaenko E.N.